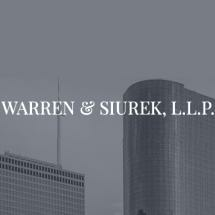 The full-service employment law offices of Warren & Siurek, L.L.P., were founded in Houston in 1992 to assist hard-working Texans with a broad range of workplace legal matters: from long-term disability benefits denials to disputes over executive compensation, from FLSA claims to FMLA issues. If you were wrongfully terminated or discriminated against amid a hostile work environment, or need an employment agreement enforced or challenged in Houston, Harris County or surrounding areas, Warren & Siurek attorneys can help. Our lawyers work hard to provide appreciative clients with employment law solutions and have for almost 20 years. Managing partner Mark Siurek, partner Kemberly Warren and attorney Patricia Haylon bring decades of combined experience to the problem solving they perform every day. Mr. Siurek specializes in all aspects of labor and employment litigation and has extensive trial and arbitration experience. Ms. Warren, a founding partner of the firm, is board certified in residential real estate law. Ms. Haylon is of counsel to the firm and concentrates her practice in employment and labor litigation. For an initial consultation with the skilled employment law attorneys of Warren & Siurek, L.L.P., call 832-699-1988 or toll free 877-497-0328. At Warren & Siurek, L.L.P., our Houston, Texas, lawyers are workhorses, not show horses. We go the extra mile for our many appreciative employment law clients' hardworking people with goals and dreams, and rights that must be protected. For over 20 years, Mr. Siurek has handled a number of FLSA claims in which workers were underpaid for their work or denied pay for the overtime they put in. The experienced Houston lawyers of Warren & Siurek, L.L.P., are on your side. Since 1992, we have held employers, supervisors and co-workers accountable for their actions at places of employment. At Warren & Siurek, L.L.P., in Houston, we are all too aware of the reasons that employers and employers' insurance companies deny disability claims, despite your established ERISA coverage. Federal law requires that your employer is responsible for providing reasonable accommodation for your disability in the workplace. If the employer fails to reasonably provide for your specific situation, he or she may be in violation of the law.